St Orland�s Stone Walk, Strathmore, Drumgley, Padanaram, Mains of Ballindarg Farm. If there's something you've always wished for, then this may be the walk for you. The the route passes an ancient Pictish standing stone which, according to legend, holds the power to predict the future. St Orland's Stone, standing some two metres in height, occupies a field in the agricultural lands of Strathmore. Decorated with intricate carvings, it became a wishing stone in the 18th and 19th century. Local lore has it that young women made their way there at midnight to consult it on questions of love. Whatever power the stone may have, it adds a fascinating dimension to a fine country walk. 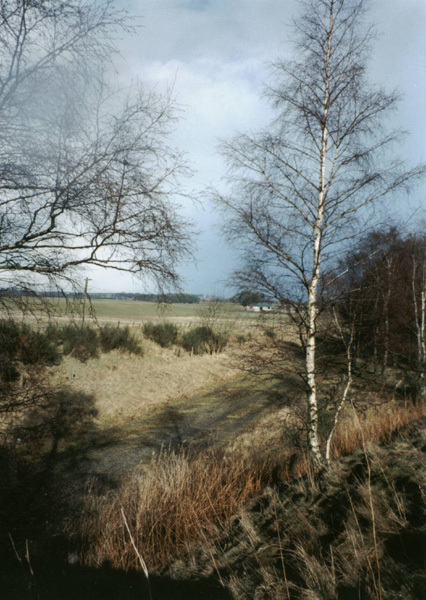 Leave the A928 and set off up the track between and open field on the left and a peaceful little woodland on the right. The trees separate you from the trackbed of the former Strathmore railway line but the pair soon meet up and run parallel. The track passes a cottage and an old stone barn on the left before reaching a bridge over the railway line. Don't cross this but carry straight on. A mile from the road the track passes a track on the left - ignore this - and continues to reach brick gateposts with ornamental lions on the right. Turn right, go through and the way crosses the railway line. On the other side, bear left, skirting past the farm buildings and the track runs parallel to the railway again for a short distance before curving sharp right, running through open fields. Two miles from the start and in the field on the left stands Saint Orland's Stone. It can be reached by a small path running down the edge of the field. Back on the track, continue straight on, passing through Haughs of Cossans farm. The track kinks before crossing a burn and, a mile on, beyond Nether Drumgley, it emerges on to a minor road. Now three miles from the start, turn left here and head north on the single track road past neighbouring Drumgley on the left. The route crosses over the former railway line again before dropping down to Padanaram school at a junction with the A926. Four miles from the start, turn left here and follow the minor road west. The route passes through open fields and half a mile on crosses an old railway. A short way on a road on the right leads into Mains of Ballindarg Farm. Don't take this but carry straight on, the way dipping into a small den before rising up to run through farmland and an avenue of trees. Carry straight on until you join the A928. Your are now six miles from the start. Turn left here and cross the road to the pavement. Follow this south into the tiny hamlet of Roundyhill and continue south alongside the road. In half a mile you are back at the start. Map OS Landranger 1:50,000 sheet 54. Start On the A928 two miles north of Glamis, at the junction between the road and the track signed to Cossans Crossing (grid ref 376491). Parking Roadside parking at the start, but don't block the track end. Grading Tracks and country lanes. This is a level route suitable for walkers of all ages. Take care on the road sections, particularly when crossing the A928. Further reading If you're looking for other walks in the area, pick up a copy of the book 'Walks into History' by Laurie Rogers, published by Angus Council and the local tourist board.